That's right folks, we have retired the original tailgate bus and have created a new and inproved T2. We still have some work to do come spring such as a new paint job and installing under bus storage, but the interior is 90% complete and the vehicle is ready for service throughout the winter. 40 seats and 10 tables with cup holders makes this the largest Party Bus in our growing fleet. On it's madien voyage, we filled the bus with Santa's, Mrs. Clauses and a few elves and you can see the pictures in the photo gallery. Our tailgate parties are always a good time and quite the good deal. We will post events on our calender as they come up, or you can check out the tickets page to see what is available. If you have a date in mind, just email us and we will do our best to put together an event on that date! We now have the T3 & T4 tailgate buses. These buses have even more room inside for coolers and tailgate gear and the T4 even has underbelly storage for the grill and other excess gear. We have now added a Limo Bus that holds 26 people! Perfect for that special occasion such as anniversaries, rehearsal dinners, group dates, etc.... check it our on our website! Now... for the party buses. 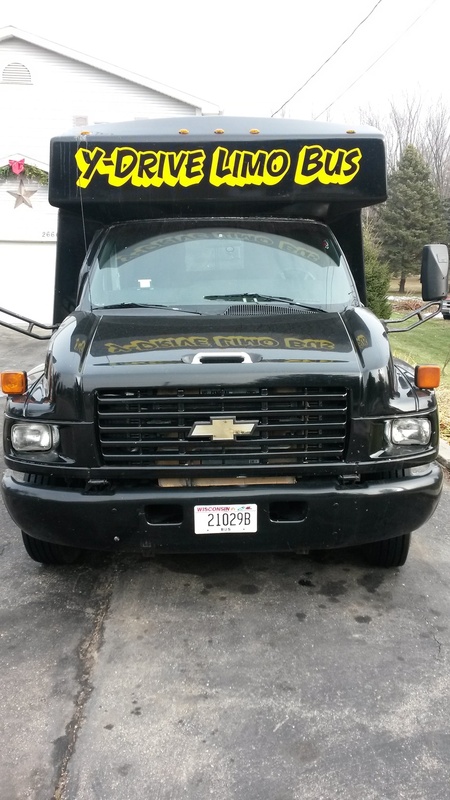 First of all, you can always hire one of our party buses for your own private group, but if your group is too small and you have a destination in mind, let us know about it and we will try to get a package put together and see if we can get enough others to go also. We need a minimum of 15 people to make an event viable. In other words, if you are a group of 4, you can reserve 4 spots and as long as we get 11 or more others to buy in, then the event is a go. This is a great way to make new friends and get to events without the hassles of driving, parking and staying sober. You can eat or drink in any of our vehicles, just no smoking. We are trying to create a new way to have a fun yet safe time. We are even working on a system where if you know you are going to be drinking all night and need to be dropped off at your home, we can do so after the main drop for a small charge. This means NO DUI WORRIES!!! At the begining of the trip, you can either be dropped off at the pick-up location, or have somone take you back to your vehicle the next day when it is safe for you to drive. Pick-up and drop-off locations are originally posted as Delavan and Lake Geneva as defaults. If 33% or more of the group is from a different location, we can change them as needed. Please drop me an email asking me to add you to the party bus email list. I will NEVER sell or spam this list. It's sole purpose is to alert you when a new event posts. Please tell your friends about this service. The more events we do, the better deals we can get. It takes a large list of people to find 15+ who are interested and available on any given event.